To enter into a relationship with Clare of Assisi for fifteen days is to race along carried by the momentum of a woman burning with love. What a paradox: the cloister of Saint Damian -- closed in upon itself -- opens to the infinite. Clare, a pilgrim of the interior adventure, always re-directs her readers onto the road towards the Lord. The loving kenosis of Christ captivates her and incites her to a Passover, brisk as a dance step, on the path of happiness. The love that fills Clare with life springs forth like a fountain in her heart. Marie-France Becker, a Poor Clare in the Monastery of Malonne (Belgium) for forty years, is internationally known for her work on the writings of Clare of Assisi. 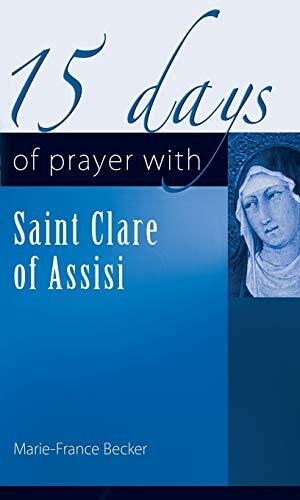 Occasionally, she facilitates conferences or retreats based upon Clare of Assisis spirituality.